The idea of someone paying you to shop is quite an attractive draw. 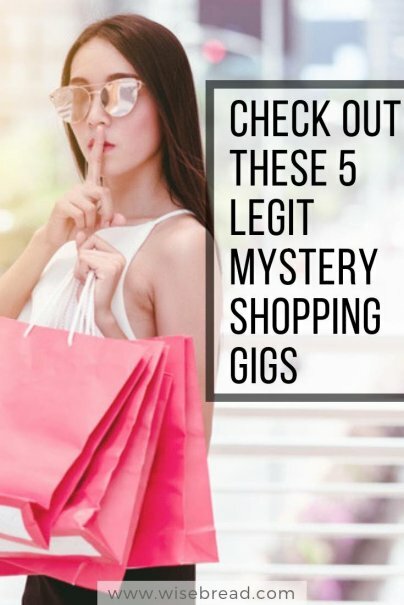 But unfortunately, due to rampant scams over the years, many shoppers roll their eyes at the idea of being a mystery or "secret" shopper. With this in mind, I want to detail some completely legitimate companies that will indeed pay you to shop and provide detailed feedback about your shopping experience. Mystery shopping jobs could be anything from walking into a convenience store and examining the cleanliness of the joint, to making a purchase from a major retailer and grading your overall customer service experience. It's definitely not a get-rich-quick scheme, but a legit way to make some extra money, often on shopping you'd be doing anyway. Here are a few companies worth pursuing. For over 30 years, the folks at BestMark have been providing valuable data and information to retailers via their mystery shopping program. They provide 10,000+ mystery shopping assignments every month that span over 12 industries. If you're at least 19, have reliable transportation, and Internet access, you can apply for jobs in your local area. The key to success with your "shops" is a keen eye for detail and the ability to express them concisely via written reports. Your initial jobs, referred to as "shops," will pay in the $7-$20 range each. Once you get your foot in the door and start to deliver excellent reports, your pay schedule can rise substantially. Variety is the spice of life with IntelliShop, as their mystery shopping program serves over 50 industries including retail, real estate, automotive, and restaurants. If you have at least a high school education, reliable vehicle, and a working computer with online access, you can apply. Preference will be given to those with strong writing skills. Noticing a pattern here? They also have a shopper rating system that allows you to move up on their pay schedule if you do solid work and avoid any "Flake" or "Cancel" citations. As for pay, expect $8-$20 per "shop" to start. The team at MarketForce has been around since 1972 and has a strong track record of training skilled mystery shoppers to help improve a customer's overall experience. To qualify, you must have a high school diploma, a working computer with Internet access, and be at least 18 years old. They will reimburse you on any purchases that the "shop" assignment requires. And yes, you get to keep your purchases — which is a really cool perk. Jobs pay anywhere from $5-$50 depending on the time involved to complete them. It's also worth noting that higher paying gigs will require you to have a digital camera available for use. Since 1995, Pinnacle has been assisting financial institutions with valuable information via mystery shoppers. They have the same minimum requirements as the companies listed above; high school diploma, computer, and reliable transportation. They differentiate themselves by focusing on banks, credit unions, and financial service companies. Some jobs only take 2-3 minutes to complete, while others can last an hour or longer. Their pay schedule ranges anywhere from $4-$110 per job depending on the time involved. If you'd rather solely work from home, then their telephone and Internet shops could be a perfect fit for you. Sinclair has been around since 1987, and is one of the more reputable secret shopping companies in the U.S. Once approved, you can pick the "shops" that appeal to you. Their jobs include restaurants, banks, and retail establishments in your town. You'll start at $6-$15 per shop and get partial reimbursement on purchases (if required). Most of their assignments will take between 10-25 minutes to complete. Their training program is highly regarded and includes video tutorials on the "shops" that you've chosen to complete. Unfortunately, not all mystery shop gigs are completely above board. Here are the sure-fire red flags that the mystery shopping job is a total scam. If the company requires you to pay a fee before they give you any mystery shopping assignments, it's a scam. Legit companies will never require you to pay money. If you're required to pay for training in order to be considered mystery shop "certified," it's a scam. Legit companies will never make you pay for training. While some companies may require your social security number for tax purposes, they'll never ask you for your credit card information. If you find a mystery shopping gig via the Internet or Craigslist, and you're dealing with an individual rather than a company, it's almost positively a scam. Only deal with reputable companies that have a solid track record with the Better Business Bureau. For more information on avoiding mystery shopper scams, visit the Federal Trade Commission's page on mystery shopping. Just wanted to pip up and add that the entire "SASSIE" shopping system is legit. They have an app which displays a map of all the mystery shopping gigs from ALL companies in the "SASSIE" system (including intellishop and about 200 others) in your area. Where I live, there's never less than 200 shops available within 25 miles. (Granted, I live in a highly populated area, pop. 1 million+) but the huge number of companies ensures you'll find SOMETHING worth applying for.